I can be a serious person, honest. I have had my museum blog for nearly two years and I have written about a wide range of topics including; reviewing historic sites, discussing the latest development in the sector, recording my own archival research and how I would run my fictional castle(Ok the last one was a bit silly). My most read post to date is about a subject that is very close to heart of many people I know; the state of the job market in the cultural sector. Nearly 150 people completed my survey that illustrated the difficulties in securing employment in a very competitive sector that contradictory offers extraordinary job satisfaction. In complete contrast, my second most read post to date is one entitled ‘10 things everyone thinks when they go to a museum.’ An entry that consists mainly of photos of things I think at museum and only took a mere fraction of time to write compared to the Career Survey. It features serious questions as ‘Am I too old to dress up?’ and ‘Didn’t they film that show here?’ I have yet to come across anyone that disagrees with this, which is somewhat reassuring. I don’t know how prevalent the idea that museums are stuffy old buildings filled with boring ancient exhibitions is anymore. It isn’t my area of museum expertise but the post was meant to show the lighter side of the heritage sector. I am not always thinking about that when I visit as there are museums I been to that deal with sensitive subjects where such thoughts never cross my mind. I didn’t also include comments that pop up as someone who works in museums and has a degree in Heritage Management as they were a bit too niche (they included spotting typos in interpretation and comments on queue managing systems – exciting yes?). I have really enjoyed the feedback on this and it’s great to have struck a chord. I know I haven’t really explained the ‘Reasons to be silly’, the title of this post but surely the whole point of being silly is not to conform to such traditional expectations. So if you see a tallish women with long curly hair in her mid-twenties eyeing up the dressing up clothes in a museum, there is a pretty high likelihood it’s me. Care to join? 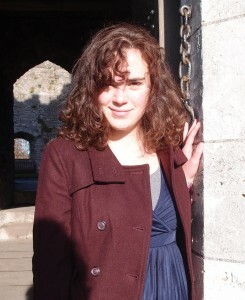 Angharad Bullward, can often be found getting overexcited in a variety of heritage sites and museums throughout the United Kingdom. On her blog, she documents her recent trips and musings, attempting to engage people with heritage regardless of whether they regularly go to museums or not.